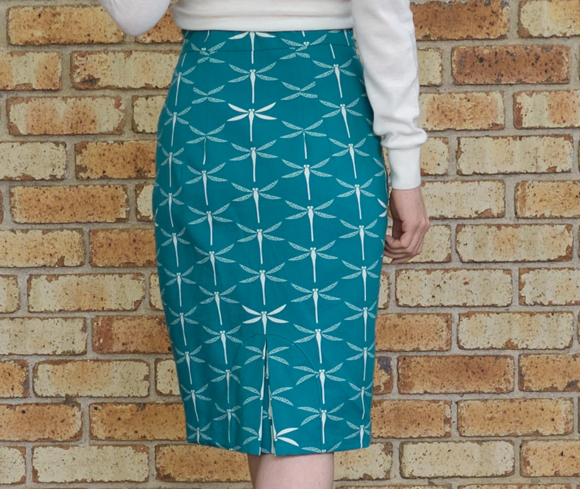 This is another pencil skirt using Gerties double darted Pencil Skirt pattern from her first book that I’ve made before here. I used a couple of ideas on it that I thought may be of interest, including a really interesting way to do a kick pleat when there is no centre back seam. 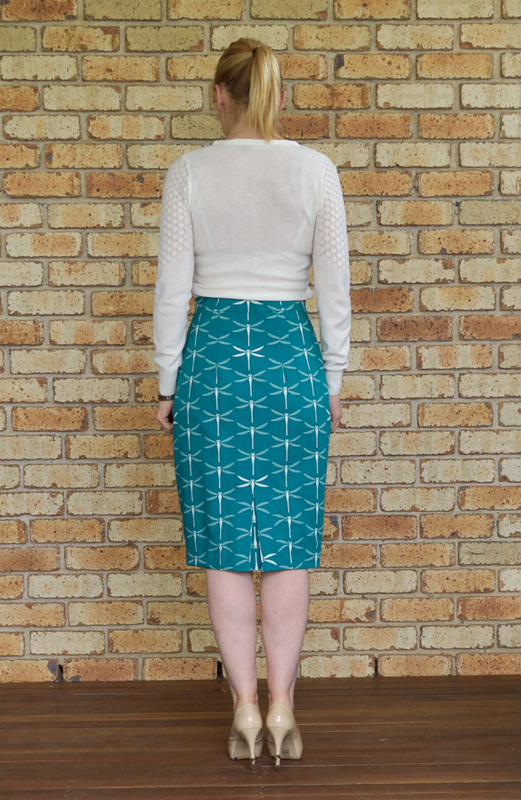 Firstly, the pattern does not include a back vent, which doesn’t really work for me as I like my skirt fairly pegged and then I can’t walk in it without an opening in the back. A split, which is what is often used many of the basic pencil skirts out there, tends to rip and pull on walking, so I am not a fan. Plus in some cases a centre back seam is not wanted, like in this case. 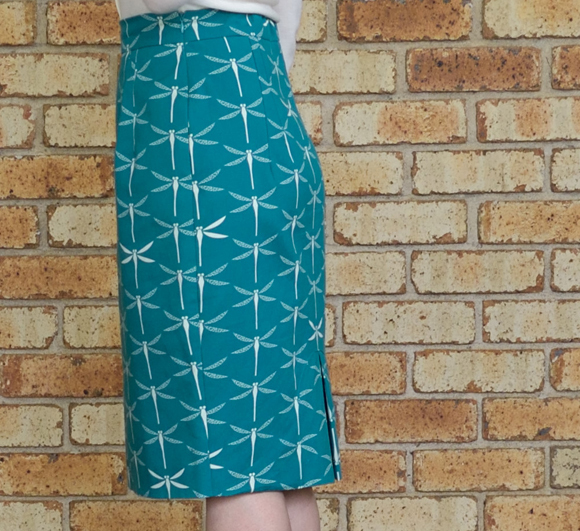 For this skirt I used an organic Cloud9 fabric in a sturdy cotton canvas (it would make a great tote bag or something but I decided I needed it to be a skirt instead) and didn’t want to break up the print with a centre back seam. 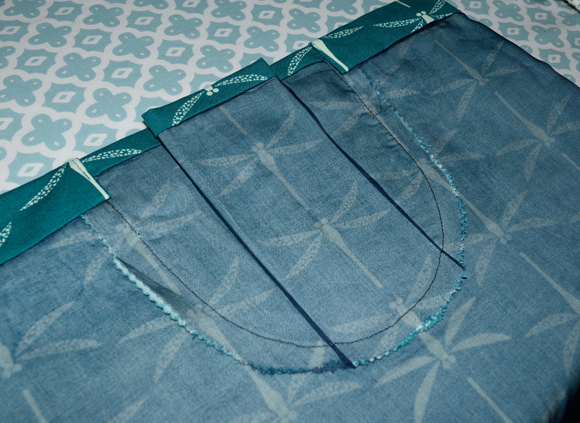 I shifted with zipper to the side and eliminated the back seam. But I still needed to walk so I added in a kick pleat with a difference. It works really well and adds a little something to the skirt without breaking up the print. 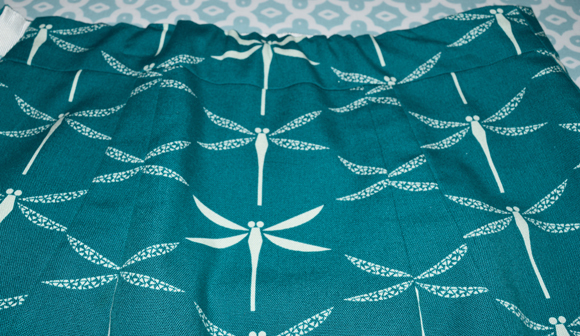 The dragonflies on the actual kick pleat are upside down this is because I experimented with a few different ideas and started of with a semi circle flouce, inspired by my Cake Hummingbird Skirt but ditched that idea as it didn’t drape very well and the only way I could fit the kickpleat then was to have the dragonflies facing the wrong way. I still managed to get everything lined up reasonably well though and I am liking the crisp pleat much better than a non-draping flounce. I just pinked the seam to finish it as the fabric hardly frays. Here you can also see my silk organza underlining, I do this to turn any fabric that creases or lacks enough body for a pencil skirt into something that looks, feels and wears 100 times better. 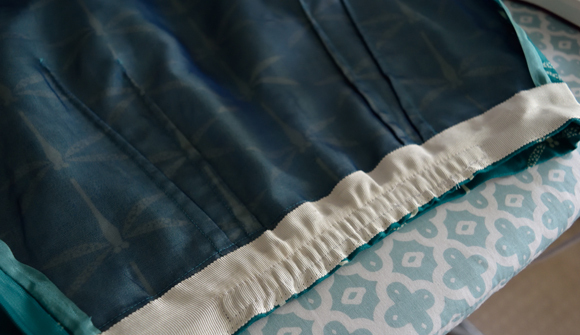 I couldn’t really do much on the pattern matching on the sides but it does show how much the skirt tapers in from hip to waist and you can see the invisible zipper going straight up to end at the top of the waistband. My other little “trick” I used on this skirt was as my weight dropped a little after I made it the waistband was too loose so I sewed some elastic into the waistband facing (in this case I used some lovely rayon petersham ribbon) which brings in the waistband to a nice fit without feeling too tight. Spring is working it’s magic in Sydney so I expect to be getting lots of wear out of this soon. Meanwhile, I am looking forward to sewing myself another coat soon as part of the Amazing Coat Sewalong hosted by Erica Bunker, there is also jacket tailoring sewalong hosted by Gail from Todays Agenda which will probably get me motivated to finally sew up McCalls 6172. Finally, I set up an instagram account to join in all the sewing fun over there, you can find me there as @sewhopeful.